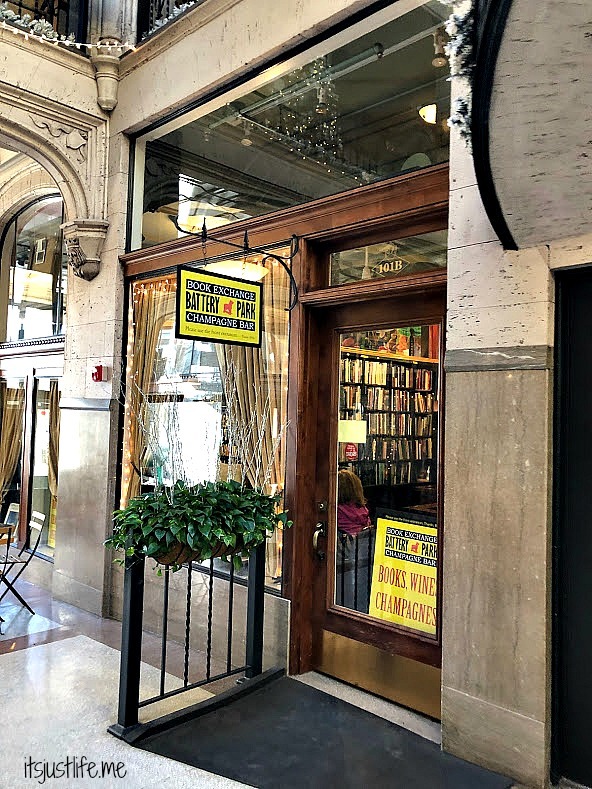 Battery Park Book Exchange and Champagne Bar located in the Grove Arcade in Asheville, North Carolina is as close to a perfect marriage as you can get. Books and champagne just naturally go together and when Chris and I walked into the Book Exchange and Champagne Bar we both got the same thrill. The shop is filled with amazing finds – too many to take in on just one visit. 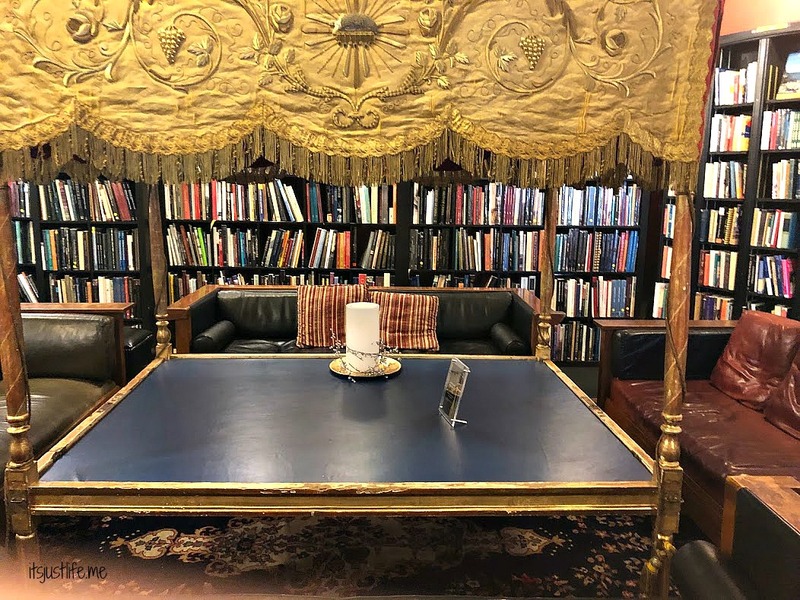 While they specialize in books about North Carolina, American History, the Civil War and the American South you can find just about anything in this massive used book store. 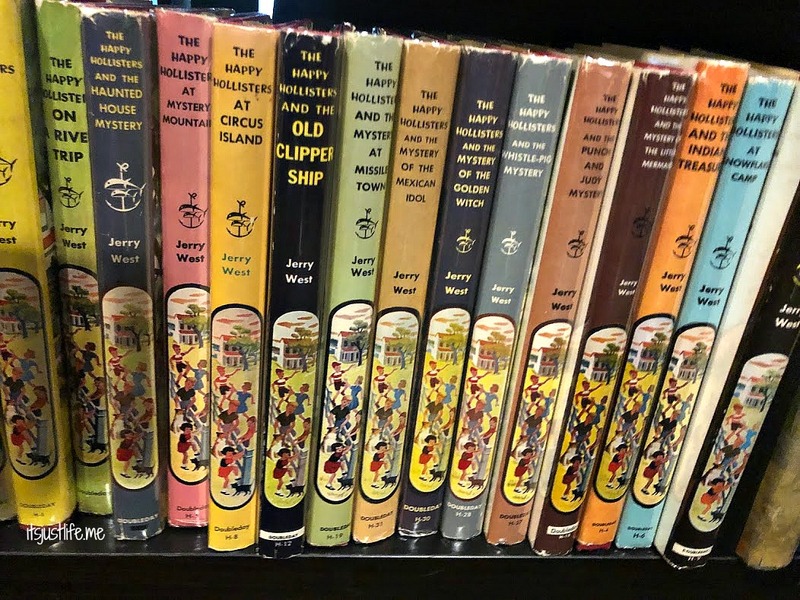 Any of the helpful employees can guide you to the section that interests you the most or you can just wander around aimlessly which is my usual mode of operation. Located amongst the many shelves of loveliness are plenty of seats for browsers and buyers alike to sit and enjoy the atmosphere. There are lots of spaces tucked away from the flow of things upstairs for those who want a quieter space. Of course the fun thing about this place is that it is a Champagne Bar. 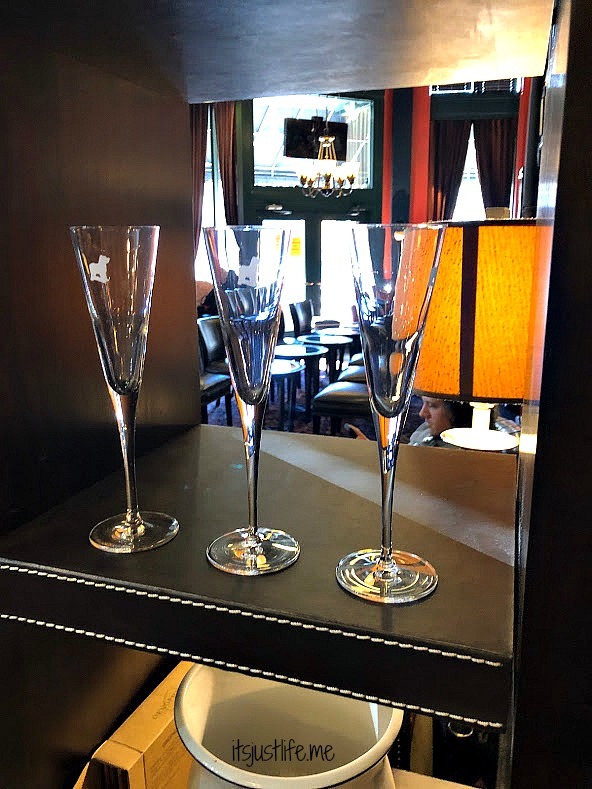 They boast an impressive list of champagnes and wines by the glass and offer small bites for customers as well. 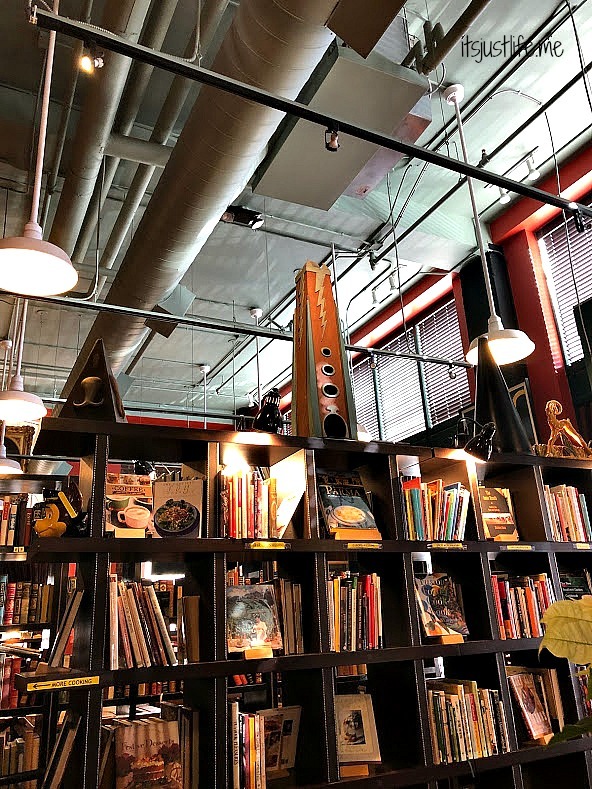 You can enjoy a glass of lovely wine while snacking on some Smoked Trout Dip and Pimento Cheese spread all while checking out their massive book offerings. What could be better? The Battery Park Book Exchange and Champagne Bar also offers live music on the weekends which is a huge draw. Asheville and the surrounding area is known for art and music and we are always amazed at the talent that is everywhere. 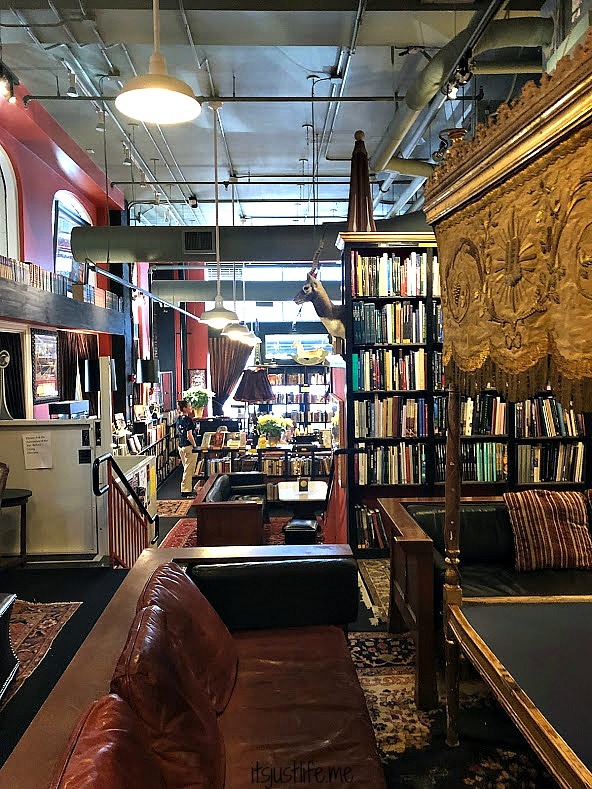 Being able to combine a wonderful setting as a book store with live music just completes the entire experience for me. Did I mention that there are some amazing finds here? Check out this blast from the past. 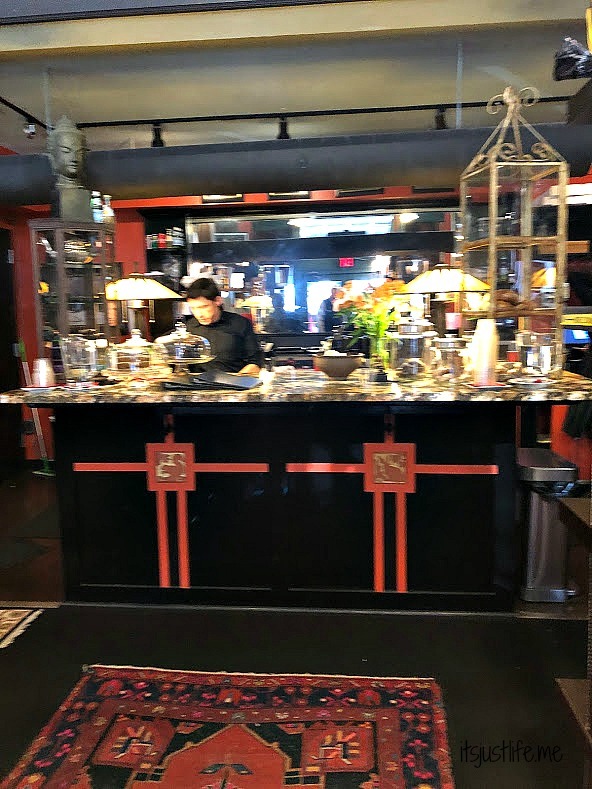 When we visited we were able to get the tour by owner Donna Wright who graciously shared all of the great things that the place could offer. We spent a bit of time with her and I was so impressed. 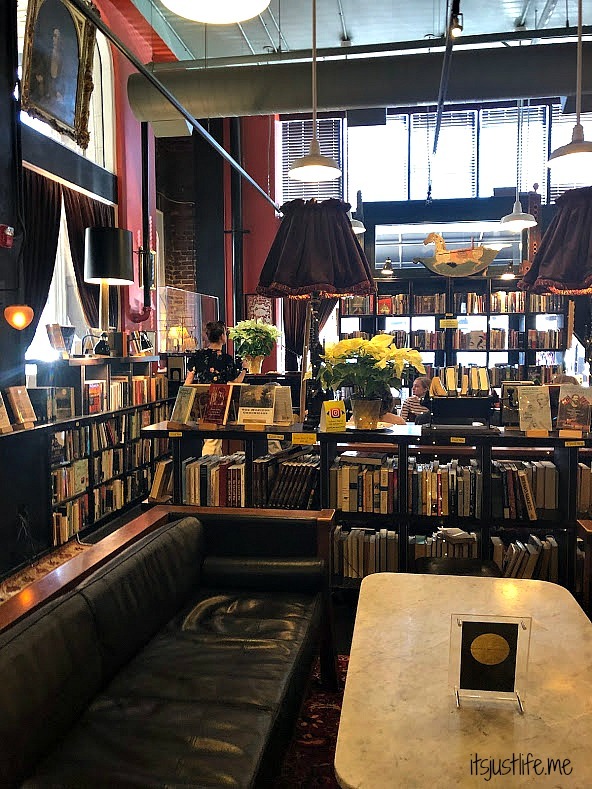 Not only is it a great bookstore and spot to relax it is also a sought after venue for events. Our main point for our visit that day was to see if it would be a good place for a pre wedding day Meet and Greet and Donna was able to steer us in the right direction. We are thrilled that the space is available and that Aaron and Erin loved it as well for a pre-wedding spot. But you definitely do not need a special event to enjoy this place. It is a great spot to pop into anytime and guess what? 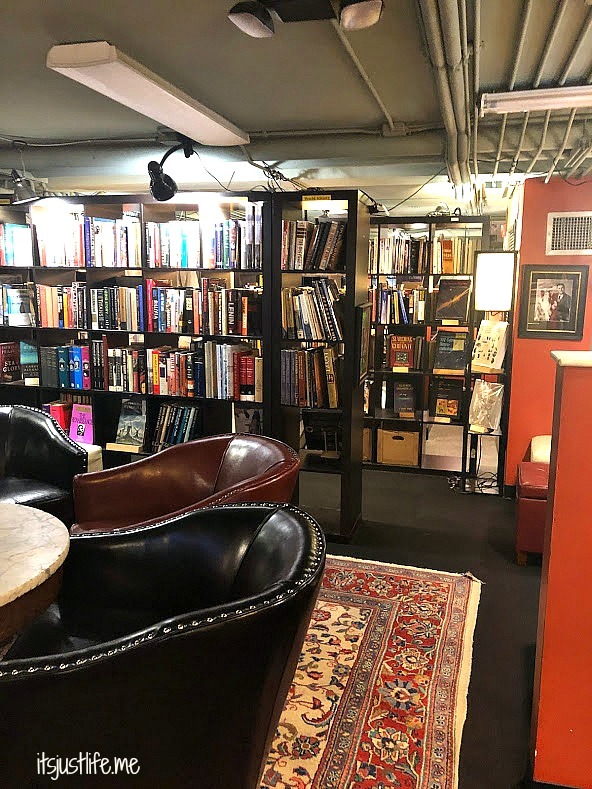 It is dog friendly as well so dog lovers can find a spot to relax, enjoy a nice glass of wine, some snacks and find a new favorite book or two. Or three or a a dozen. 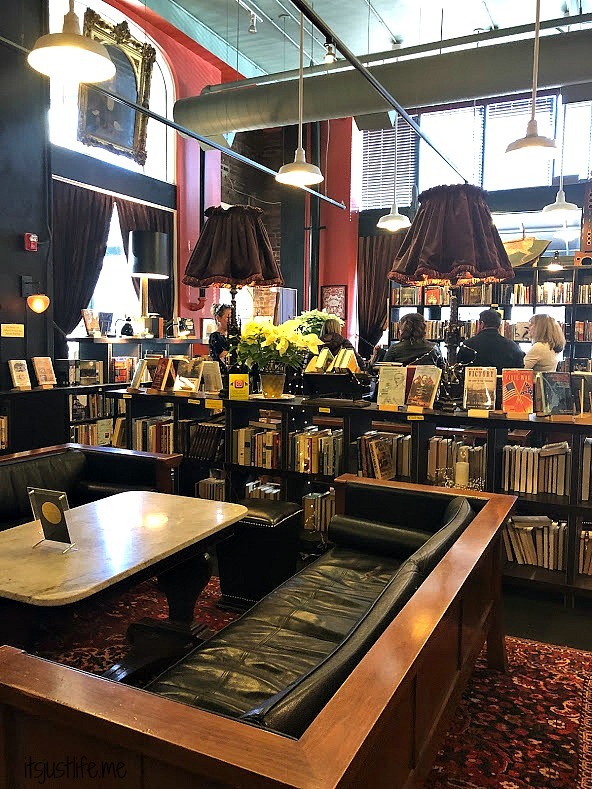 Next time you are in Asheville make sure you pop downtown and check out The Grove Arcade and wander around The Battery Park Book Exchange and Champagne Bar. Let me know what you think and what your favorite part of this place is. Remember to Comment for a Cause — PAWS. This is my kind of place. What great ambiance and a perfect spot for the pre-wedding meet. I agree. Aaron found it and we had been there before but not really looked at the place so it was fun to explore it and see all the little nooks and crannies. I’ll join you in wandering aimlessly! What a place! Isn’t it great? I would love to share it with you! What a comfortable, quaint setting. We used to spend some time in Ashville in the summer and the town had a lot of interesting places to see. Frank loves books so he would probably find a book or two and enjoy the day there. Asheville is a really fun place and this is definitely one of the best it has to offer. I could see Frank settling in for a little while here in one of the comfy leather chairs upstairs. It’s definitely a fun place! 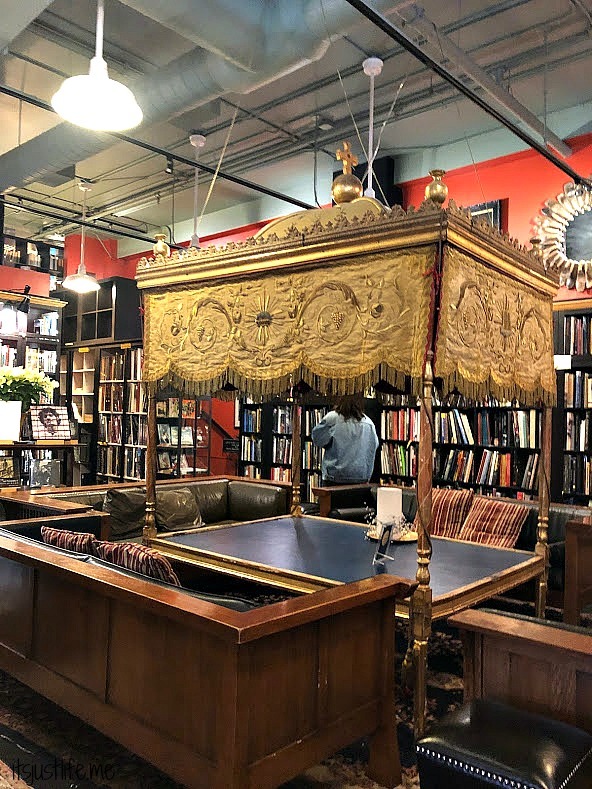 This is probably the most unique bookstore I’ve ever seen. I understand why you love it. Pretty neat, huh? Even if you don’t “imbibe” it is still definitely worth a trip. You had me at books & champagne but then… Smoked trout & pimento cheese! Why don’t you try and stop me! Can’t wait to check this place out! What a fun combination! I can’t really stomach champagne but do enjoy a mimosa here and there. The good thing is they have other options! I would not be drinking wine or champagne in the middle of the day for sure but coffee or tea—sure! It looks and sounds like Battery Park Book Exchange puts Barnes and Noble to shame. It looks like a great place to relax and enjoy. It’s such a great place and they are all so nice as well so it is a win win! What a cool place. Your photos are great and I feel like I was here for a moment. I can’t think of a better combo than books, dogs and a champagne bar. Last time I was there all the tables said they were reserved for paying customers only. I don’t see that in these pics so that may have been a one-time thing. I didn’t see any signs like that at all when we were there. Maybe there was a special event or something? I have no idea but when we were there there were tons of folks just hanging out without food or drink. Hopefully if you go back you will be able to enjoy sitting at a table as well!